Find and compare the best prices from a range of well known car rental companies at Ankara Airport. This is a free to use facility, enabeling you to book direct with the company quoting the price. A large new terminal building was opened in 2006, catering for international and domestic flights. A shuttle bus service connects the airport to Ankara city costing approximately 15 Lira (approximately 3.50 Pounds) for the 45 minute journey. 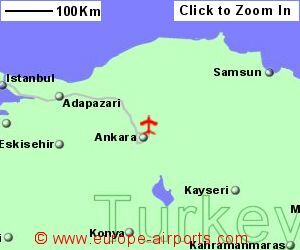 A taxi from the airport to Ankara will cost approximately 100 Lira (approximately 25 Pounds). Ankara airport has 21 bars/cafes/restaurants, 2 bank/foreign exchange facilities, a VIP lounge, 4 executive lounges, childrens play area, conference/meeting facilities catering for up to 150 people, and WiFi Internet access. 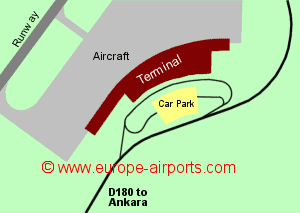 Ankara Esenboga airport has Airport Carbon Accreditation, at the Neutrality level. 15.8 million passengers passed through Ankara airport in 2017 (nearly 90% of which are domestic flights), a 21% increase over the previous year.